This article was reposted from Philly Voice. 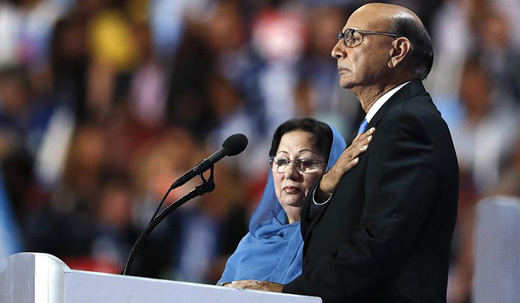 Watching Mr. and Mrs. Khan on Thursday night speaking at the convention, I began to cry. My phone lit up as friends checked in to assure me they were watching. I was acutely aware of Mrs. Khan’s trembling face, and felt great empathy for her being on that stage, exposed and trying so hard to keep her emotions in tact. I watched Mr. Khan slip his arm around her, and thought how much comfort they must take in each other. When Mr. Khan pulled out the Constitution from his pocket, I cheered. Yes , I thought, yes this has needed to be said on a major stage for all these months of campaigning – that the sacrifices of families in these long miserable years of war have come from people of all faiths. I have seen Humayan Khan’s stone in Section 60 at Arlington National Cemetery. I have attended funerals there, and memorials. It is very clear to me that the stones reflect the young, precious lives lost, and they may show a symbol of the fallen soldier’s faith, but they never show a sign of their political party, nor a dollar sign to show their wealth. How dare he befoul the air around the memory of a fallen soldier and attack his mother. When I heard Donald Trump’s response to the Khans, and how he insulted that Gold Star mother, my rage and sorrow were rekindled. My son, Sgt. Sherwood Baker, was killed six weeks before Humayan. Sherwood died in an explosion while serving with the Iraq Survey Group as they searched for nonexistent weapons of mass destruction. For many years my deep sense of loss and anger, coupled with a need to speak the truth, fueled me to speak out against the war in Iraq at every opportunity. I faced ridicule and scorn as well as support. One of the things I always talked about was that beneath the stones of Arlington are laid heroes of every faith, every gender identity, every color. They all tried to do their duty as they saw it, and what we can ask of ourselves to honor them is to be better citizens. So there on Thursday night stood two beautiful citizens, who paid dearly to be present. They spoke out against intolerance and falsehood, and to that, anyone should just say thank you. But Donald Trump took the opportunity to insinuate that Mrs. Khan was not permitted to speak because of her faith. Typically, in his cowardly way, he blamed other people for asking if her Muslim faith forbade her to to have an opinion. In answer to Mr. Khan’s question about sacrifice, Trump claimed his reckless business deals and tall bankrupt buildings were the sum of his sacrifice. Seeing that, I began to cry with rage. How dare he befoul the air around the memory of a fallen soldier and attack his mother, and somehow claim some equivalency of loss. Trump is the worst example of a citizen in the United States of 2016, out to destroy the trust we must have in each other, out to belittle and humiliate anyone who gets in his way, out to achieve power at any and all costs. Today, I cry for all the lost, and for this Country, once again. Celeste Zappala is the mother of Army Sgt. 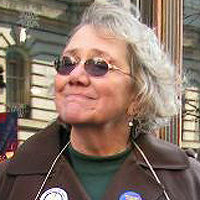 Sherwood Baker, who was killed in April 2004 by an explosion in Baghdad, Iraq while deployed with the Pennsylvania National Guard. She is a long-time resident of Mt. Airy in northwest Philadelphia and an active member of First United Methodist Church of Germantown since the 1970s.